“Call In” All Vols . . . 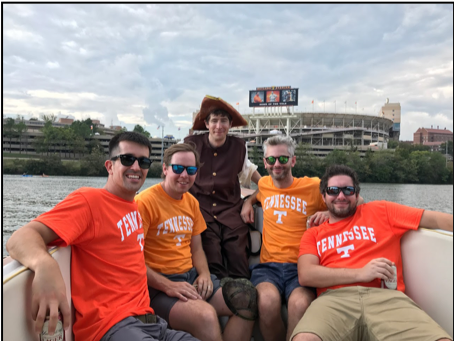 Enjoy listening to “Vol Calls” this fall, broadcast from Calhoun’s On the River, while you cruise aboard the Queen Priscilla – a genuine 1968 U.S. Navy Captain’s Tender. Pick up some award-winning Calhoun’s ribs, BBQ, and other delicious Southern dishes, or pack your own picnic basket, including your favorite beverages. Board the Queen Priscilla for your Wednesday “Call In” Cruise at the Calhoun’s dock 30 minutes before the broadcast begins. Seating is limited to 6 passengers per event, so book your event early. Reserve the whole boat for your group (up to six) for $90, or just $15 per person until the boat is full. Book your Wednesday “Call In” Cruise today at THIS LINK. Departing from the Calhoun’s dock promptly at 8 pm (eastern), you will enjoy the delightful ambiance of our downtown harbor between the bridges while you listen to the broadcast in a truly unique setting. Place your own call from the boat! The Queen Priscilla will return to the dock at 9 pm. “Vol Calls” is the exclusive state-wide radio program that invites Tennessee fans to call in and speak with the head coaches of the Tennessee Volunteers from anywhere in the United States by dialing 1-800-688-8657. 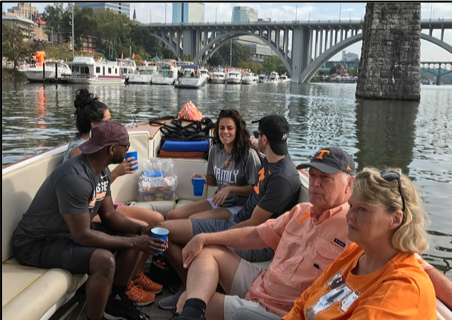 Tennessee customers of Verizon may also dial #TENN.
Book your Wednesday “Call In” Cruise today at THIS LINK.